Corruption Perceptions Index 2008 going social? 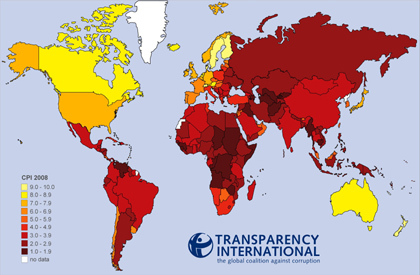 Today, Transparency International released its 2008 Corruption Perceptions Index (CPI). In its visual appearance it is as all indices a simple table. Asking myself how the score relates to each country’s rather complex national reality, and therefore how the CPI, measuring only public sector corruption, could be complemented with additional information, I came up with a couple of ideas related to how the information is presented. As a first step, improving the visualisation of the data can make it more accessible. So here’s the CPI as a world map. The Tactical Technology Collective has developed a nice guide on how to visualise information for advocacy. But better, make it an interactive google map. And the final step should be to use the crowd to enhance the information that is available in the map contributing real-time information – national news stories, bribing experiences and the like. Secondly, you can explain the data with a press release. But you can also explain it with a youtube-video. Automatically the video relates to others on similar issues. Additionally viewers can comment on it, add their own videos, and engage into a conversation. No research stands alone and needs to be seen in context with other data. The World Freedom Atlas, developed by Zachary Johnson at the University of Wisconsin, provides an interactive visualisation tool for world statistics on issues of freedom, democracy, human rights and good governance. Other examples of great presentation of information in world maps can be found developed by Maplecroft and, “as you’ve never seen it before”, on the Worldmapper website. In a future post I’ll share more interactive and social mapping projects. But in the end, does a table, a statistic, or a number mean much to people? It works well for academics and rankings are great for the media. And it is of course a question of how to measure corruption in the first place (see the Users’ Guide to Measuring Corruption by Global Integrity, or the Mapping of Corruption and Governance Measurement Tools in Sub-Saharan Africa, by Transparency International), by the way to be discussed at the 13th IACC as well. But on the other hand it has not much to do with what happens on the streets, in hospitals or in public institutions. An index meaningful to people needs to be connected to their lives and realities. More tools that combine facts and personal experience, as well as engage people in a conversation need to be developed. This will allow us to gain a more comprehensive picture of what is it exactly we are dealing with when we want to fight corruption.